A day has now passed since Arsenal drew City 2-2 and I find myself still focusing on the positives. At 2-1 I genuinely thought we would hold on to take all three points, but by the end was begging for the final whistle. It that regard there is definitely an air of disappointment, but overall it was a great game with some real standout performances. First and foremost little Jacky Wilshere was sensational. I think it is fair to say he has firmly silence his recent critics; receiving a well deserved glowing review on MOTD. Of course given the fickle nature of modern pundits this will only last until his next perceived sub-par performance, but he should definitely feel great about his progression. For me he was certainly man of the match, with Sanchez a close second (and I am not just picking the scorers a la Garth Crooks team of the week – every week). 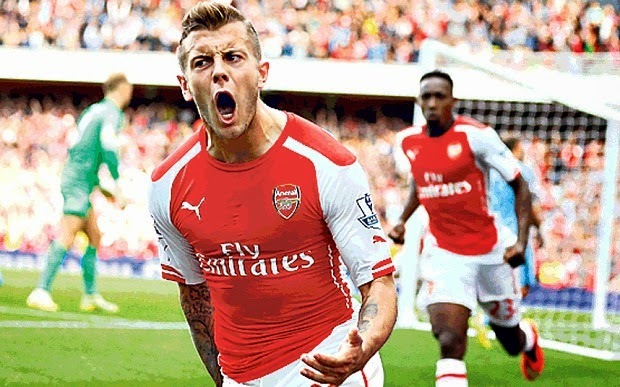 Jack was composed, hard working, creative and motivated, everything you want from a central midfielder. He was demanding the ball, particularly when we were down a goal, and everything was going through him. When he got the ball he was never wasteful and drove us firmly from one down into the lead. Young midfielders should watch that performance and aspire to it. Great to see him in top form and let’s hope it continues. We really have a great depth in midfield, Santi didn’t even see the field. Ozil had a typical Ozil performance, did a lot without looking like he was doing much (an unfortunate talent, for him at least). I think he is justifying his place in the team. Rambo wasn’t at his best but still played an integral role and got a great assist. Flamini was not on great from and was arguably responsible for their first goal. Across the back we were generally ok, bar the very soft second goal we conceded. We really need to address how we are dealing with set pieces on the training ground. We have conceded a headed goal in every game now. Was good to see Gibbs back on the bench. I feel he would have dealt with Aguero’s pace better than Nacho, but also don’t want to see him rushed back. Debuchy’s injury looked bad, possibly even a break and I don’t expect to see him back any time soon. This leaves us with a dilemma; do we call back the Corporal from West ham? I would be inclined to say we should. Not forgetting that Chambers is primarily a right back, and it would be good to see him get a good run in the team. It may even allow for him to displace Johnson in the England team if he does, and that would not come a moment too soon. Johnson scares the crap out of me back there. My concern however, is that right now Chambers is our only real cover at centre back. Now, Bellerin has really come on and could fill in at right back, but I would like to see a little more squad depth there. Jenks could always go back out on loan when Debuchy recovers. Szczesny had a good game despite shipping two goals. We are still looking for that first clean sheet though. Up top, Welbeck had a solid first performance. I was convinced that lovely chip was sailing in and gob smacked when it came back off the post. Is a real shame it would have been a great start for him. At times it looked like the speed of passing in the final third was a little too much for him and occasionally slowed up the attacks in this respect, but not by much. I am sure he will adapt quickly and we will be seamless again soon. Let’s just hope his injury is nothing to be concerned about. Sanchez was electric and what a player we have there! His work rate and team ethic are outstanding, which is great way to endear yourself with the fans. Another way is spectacular volleyed goals. Great vision and intent by Jack to set him up and a phenomenal finish. I think we can all forgive him the yellow card for removing his shirt, especially as it was clear to see how much it meant to him. He is always tracking back, hassling players and making tackles, and Arteta said on the Arsenal website that he always stays late after training. More of the same please; great acquisition monsieur Wenger. Something that is really apparent this season is the very strong camaraderie in the team. I think it is there for all to see and a product of the way Wenger has built this team. There do not seem to be any real outsiders like we have seen in the past, for example Arshavin. There is a strong English core of course, but there are also several German, French and Spanish speakers, with all groups seeming to intermingle well. You can see how genuine it is in the goal celebrations. Teammates that play for each other win together. Good things lay ahead, I can feel it. On another note, it was nice to see Lewis Hamilton at the game, didn’t realize he was a Gooner and as a part time F1 fan it has definitely increase my support for him. I like how Arsenal has always attracted a good caliber of support (Piers Morgan being the exception of course). With Dortmund away on Tuesday let’s hope the team focuses on the positives of Saturdays match and can get a good away result to kick of the group stages.